The Saint Demetrios Greek Orthodox Church has a rich and productive tradition in the Eastern Orthodox Christian Faith. This year, 2019, marks 91 years as a house of worship in the Lincoln Square community. Our parish has deeply enriched the lives of so many faithful through the countless amounts of Divine Liturgies, Sacraments and Religious Education Programming. In keeping with the tradition of our Hellenism, our Church has been a beacon of Greek instruction in both language and culture for the thousands of students and hundreds of teachers who have passed through our church halls. Our Philoptochos has tenderly helped so many within the parish and outside the parish to offer a helping hand. Our other church ministries provided for the youth are monthly and offer a social outreach for all ages. We are committed to participatory worship, decision making, consensus building, and thinking outside the box. After you've checked us out on the Internet, please come and join us in person. Our people are warm and pious. In our beautiful sanctuary, you will experience worship that is both traditional and family friendly. If you are looking for a church that feels like family, seeking true spirituality, or struggling with the pain and doubts of life in an imperfect world, please join us. I am truly humbled to serve this congregation for twenty years and through the prayers of His Eminence Metropolitan Nathanael, I give glory to God for the many wonderful works this parish has provided in the past and continues to offer in the future. Join us in welcoming Greek Comedian Basile for an evening of dinner, cocktails and laughs in the Miller Center of St Demetrios. Stop by or call (773.561.5992) the church office to make your reservation; the ticket cost is $65 and includes Dinner, Wine and the Show. 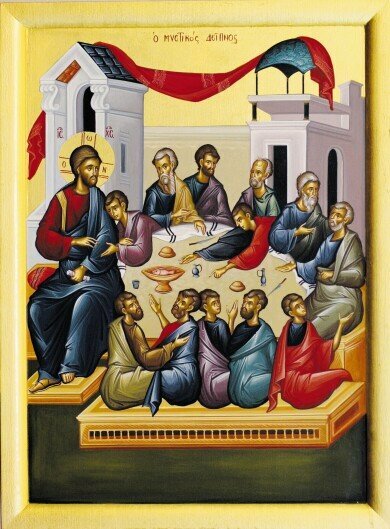 Sunday April 28 - +GREAT & HOLY PASCHA - Holy Resurrection Service 12 midnight (Main Church & Grand Hall) Paschal Liturgy & Sermon of St John Chrysostom 12:30am (Main Church), Agape Service 11am with His Eminence Metropolitan Nathanael Officiating.